Back in 2017, right before the 1st Annual Grindstone Charity Tournament, the Grindstone team sat down to make promotional materials for the tournament. Even though we had some hockey photos we’d taken, nothing depicted how we envisioned the tournament. CWHL had shared great photos of their games over the years, but we were cautious to use images of recognizable teams in female hockey. The next best thing, or so we thought, was stock photos. Imagine the surprise when our search for “Female Hockey” and related keywords came up with a very limited selection of usable photos. In a world where people constantly snap moments of their lives, it’s hard to find a great photo of a female hockey player. A photo that shows the power, determination, and hard work that every player puts into the game. A fierce look on their faces, ready to score the game-winning goal. We managed to find some images for the event. And we set a goal for the Charity Tournament weekend to get as many photos as possible to continue promote Grindstone and what we do. Tara Peach, a Kelowna photographer, came to the Jim Lind Arena in West Kelowna, BC before the tournament. We found hockey models among the Grindstone team, in our Grindstone Ambassador Camille, and moms and daughters attending the event. The first tournament was a success not only because we raised the funds to give out 10 grants, but because we walked away with hundreds of photos. At that very first tournament, I overheard a young woman talk to her teammate on the bench, “I’m so nervous. I feel like I’m having an anxiety attack. It must be the excitement.” She then giggled, adjusted her helmet and gloves, and stepped onto the ice. Her face was glowing. As I looked around the rink, I could see women on both teams share the same anxiety-filled joyful expression. There were also fierce and determined faces on the ice. There was strength, courage, and sweat. I saw female players that were just like us: bullied teens, business owners, busy wives and tired moms, sisters bugged by their siblings. We were one at that tournament. We had the world in our hands. We were ready to conquer. And we captured all that in the photos. Grindstone had a vision, but no visuals to show it. 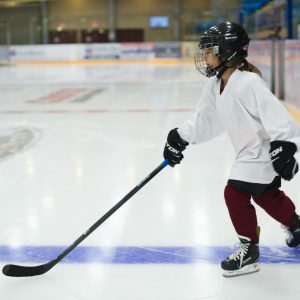 We had role models in superstars like Haley Wickenheiser and Natalie Spooner, but no inspiration in the females playing hockey for small local teams. We needed faces of women who were growing into superstars. Young girls who had just started their hockey journey and were proud of their very first goal scored or saved. Now, few short months away from our 3rd Charity Tournament, we have a gallery of photos to choose from to tell the story of the players, their families, and the common goal to grow the game we love so much. As a final note, Grindstone has always looked up to CWHL and the great work they have done to promote female hockey. 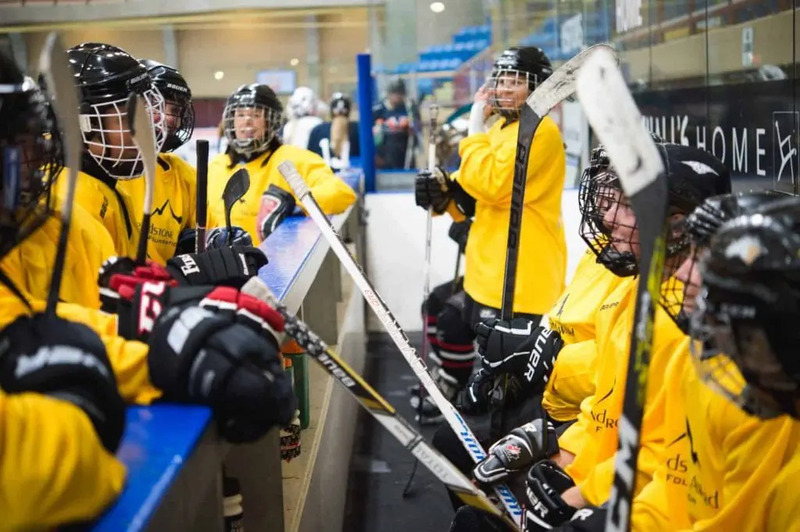 Thanks to the League and its efforts to grow the game, women across Canada didn’t have to imagine what professional female hockey players and teams looked like. We saw them on our TVs, on the news, and on our social media. We saw with our own eyes what success in female hockey meant and the pride that comes in winning the Clarkson Cup and representing Canada internationally. Many of our Girls Rock The Rink and Charity Tournament participants shared how they found role models among the CWHL teams. They found courage in women just like them who took their passion for hockey to the next level. Thank you, CWHL, for allowing us to dream big and aim higher, and for giving us a visual of what female strength means!